It’s no surprise that the most powerful source of influence we have in both our personal and work lives is our ability to communicate. And unlike money, authority, or resources, we all have this source of power available to us equally. Social psychologist and author Robert Cialdini cites studies showing that more inclusive and relationship-based language during communication has much more effective outcomes than approaches that use coercive or even logical language. It’s about both what we (choose to) say, and how we (choose to) say it. Both the ‘what’ and ‘how’ working in harmony can positively influence the outcome of a conversation or exchange. In an era of countless books and courses on leadership, why have business and corporate leaders still not mastered this essential skill? A thousand personal reasons are behind the challenge of communicating. There are those who are simply not aware of its importance or their style of communicating; or those who get stuck in the daily routine and don’t take the time in their busy schedules to improve – it is not easy work. 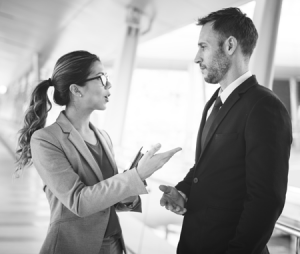 Others see communication as an unnecessary soft skill, and prioritize other leadership skills as they seek to overcome organizational challenges. Some of the challenges we have around communicating are fear of public speaking, harming the relationships with the people we are speaking to, rejection, personal shortcomings, or the unknown. We’re born with a certain expressiveness, and then our upbringing – family, school and other experiences – further influences our ability to use language. But it’s important to realize we are not stuck with it like a genetic condition. Actors and leaders use coaches, and public speakers use techniques to more effectively communicate. We are not all born Obamas, and even he had a coach as POTUS to improve his speaking. So, what can we do to leverage communication as a source of power? 1. First, what’s your default communication style? Are you stuck in aggressive language that tries to control (“My idea makes most sense” or “It’s the only way to make this happen”), or in un-assertive language that accommodates and complies (“If that’s what you think is best”)? Or do you avoid communicating altogether? Ideally, you are using language that helps to develop, understand, explore, and share information. Work on your default being as much as possible in the latter category: ask questions, listen actively, don’t withhold information that could be important to the topic or relationship. 2. Framing or giving/preparing the context before we make a statement, offer an opinion, ask for something, or present and idea, can avoid all kinds of assumptions and misreads on the other person’s part, and help get a more favourable response. Always ask yourself: where are you coming from on your statement? What assumptions have you made? What are you basing it on? What are your motivations and intentions? And then most importantly – are you communicating your context properly and openly? This kind of framing allows others to understand that what is behind your communication is not the word of law, but comes from your perspective and context. It is thus less threatening, and becomes more a contribution to the whole and potential further discussion. Also, are you properly framing by focusing on the relationship and using inclusiveness in your language – in other words, are you making this an ‘us’ together issue, or a ‘me’ versus ‘you’ issue? 3. Equally valuable is expressing very clearly our expectations, on the smallest to largest thing: What do you want that memo to look like? Exactly how often do you want reporting done and in what format? Do you expect 110% on this project? What kind of feedback do you expect? The clarity this provides can mean saving a lot of time, tears and potentially damaging exchanges. Both setting expectations and framing in part contribute to what Robert Cialdini examines in his new book, Pre-Suasion: A Revolutionary Way to Influence and Persuade, even before a conversation starts, before the favour is asked, or the collaboration begins, etc. 4. Using positive language instead of negatively framed language can completely reverse the direction of influence. Are you shutting down thinking, and raising walls with your choice of words or focus? Or are you opening thinking and conversation up to opportunities, bigger picture thinking, innovation, and resolution? An example would be saying “You haven’t listened at all to what I said, have you?”, which elicits an immediate defensive reaction and shuts down collaboration, versus “I really need you to listen right now so we get this right – I know I can count on you for our success,” which clearly states a desired behaviour and is encouraging as well. 5. Related to positively framed language is the idea of assertiveness: communicating in a way that expresses something in terms of our needs, clarifying what behaviours are undesirable and which are desired in meeting those needs. This eliminates finger-pointing, focuses on a tangible, positive vision, and communicates healthy boundaries, all leading to better outcomes. 6. We also express ourselves through our body language: there are a hundred ways we can shut down or conversely open up a conversation, through facial expression, gestures, positioning and posture. Is your body language creating tension (e.g., sitting or standing directly in front of someone), showing openness (e.g., palms open and upward), demonstrating authority and insight (e.g., holding your chin while promising to give something some thought), or communicating fear (e.g., rubbing your neck or fiddling with jewellery)? 7. And last but not least – a very minor but effective touch to communication that has a proven positive influence on getting someone to be more open: simply using a person’s name and a sincere greeting every time you connect with them (“Hi Suki, what can I do for you?” or “Hi Ethan, how is your day going?”). As leaders it is time to practice, practice, practice! Research shows the more influence we have, or even think we have, the happier we feel. So work on the one area we all possess, our personal expressiveness, and you will be motivated by the success you have engaging others and gaining consensus on work issues with your colleagues. To dig deeper into the topic of influence and communication – whether or not you’re in a leadership role – see our upcoming course dates in Ottawa for Using Positive Influencing Skills in the Workplace. If you’re in need of a group training session, contact Sophie at sgouedard@pmctraining.com or 613-234-2020 ext. 21.